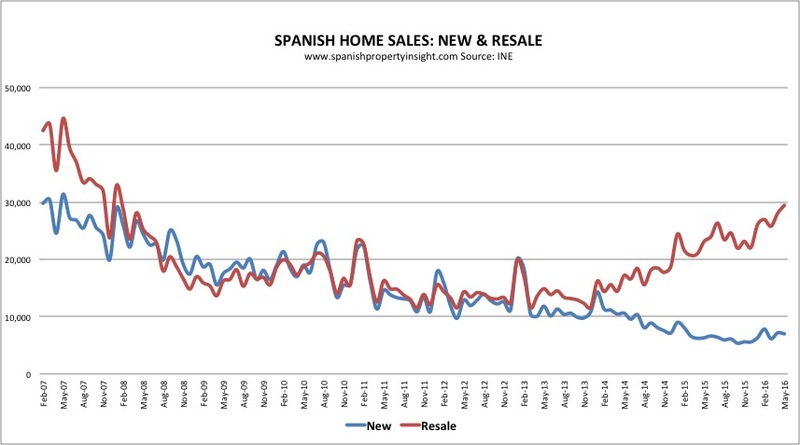 May was another month of strong sales growth for the Spanish property market, reveal the latest figures from the National Institute of Statistics (INE). There were 32,512 homes sales recorded in the property register in May (not counting subsidised housing), up 23% up on the same month last year, the fourth consecutive month of double-digit annualised increases. If you exclude 2010, when sales were inflated by transfers between banks and developers, that is the highest level of sales in May since the boom year of 2008, though the market is still a long way (-53%) from the high reached in 2007. On an annualised basis, sales have increased in 25 of the last 27 months. Year-to-date (first five months), home sales are up 16% compared to the same period last year, and 25% compared to 2014. 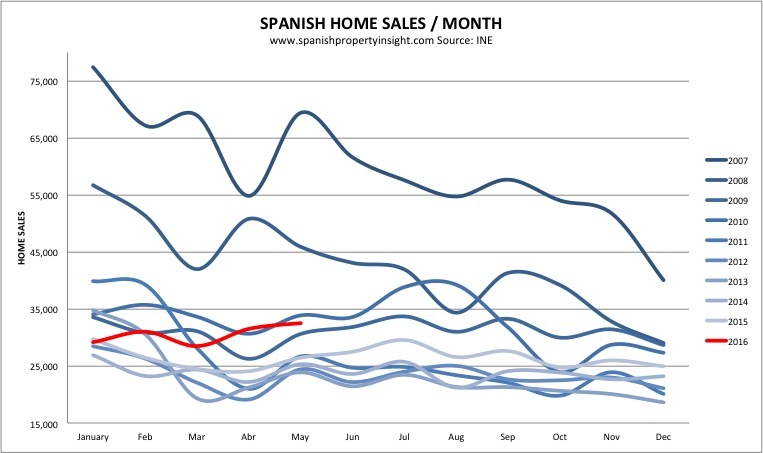 So it seems the Spanish housing market recovery that began in 2014 is still on track (in sales terms at least), despite political uncertainty at home, and worries about the global economy making markets everywhere jittery. I prefer to look at the regional picture in year-to-date figures, as one month’s numbers alone are not much to go on. 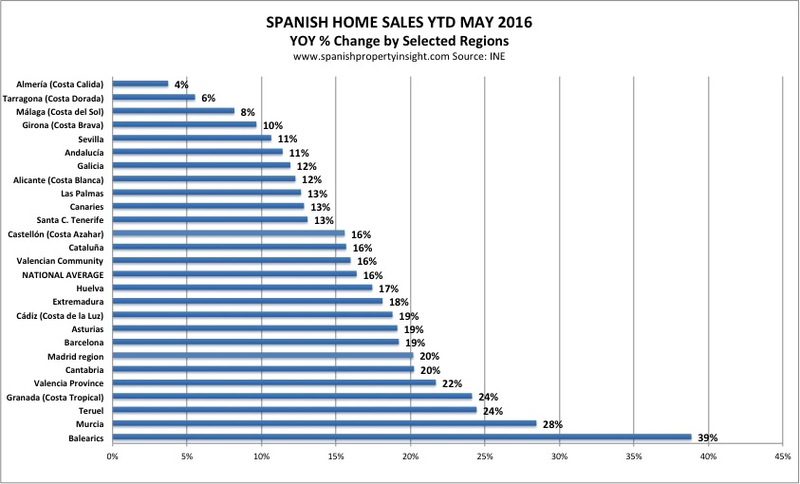 So far this year the Balearics are way out in front, with sales up 39% compared to 2015. Murcia is also staging a strong recovery (+28%), as are Valencia city, Barcelona and Madrid. As I have pointed out in previous months, Alicante (home to the Costa Blanca), and Malaga (home to the Costa del Sol), are growing, but below the national average. I suspect this has something to do with muted British demand in the lead up to the UK’s Brexit vote to leave the EU. We will have to wait a few more months to get sales figures broken down by nationality to see what has happened on that front. New home sales increased for the second month in a row, having declined for most of the last 10 years. As I said last month, I think this is the beginning of a recovery in the new development business in Spain. As I start to showcase new developments for sale in Spain I’m hearing reports from developers of a big surge in foreign interest. I expect the most attractive developments to sell fast after years with hardly any new projects on offer.